Add a personal flourish to your wedding day décor theme by customising your place settings, centrepieces and party favours to make them totally unique. Every bride and groom dreams of planning a unique wedding that will dazzle guests and help them to remember the wedding for years to come, but making that kind of wedding happen comes down to one thing: attention to detail. Whether you want to present perfect wedding jewellery, the most mouth-watering menu or superlative bridesmaids’ dresses, the same rules apply. DIY décor can make the difference between a cookie cutter wedding and one filled with personal flare. Here are some ideas to help add that unique touch to the proceedings. There’s no doubt that personalised wedding favours add a snap of colour to the table, and consequently play a big part in the décor of the big day. If you are bored of gorging yourself on the same name-stamped chocolates that many newlyweds lay out for their guests, it’s time to get baking. There are few sweet treats that taste better than homemade cookies, and if you make them yourself, you can incorporate unique ingredients (think toffee, marshmallow and white chocolate chips), and decorate them as you see fit. This is a great activity to include in a hen (or stag) party, although you might want to get the icing portion of the decoratation out of the way before you indulge in any cocktails. Who knew there were so many ways to transform a simple jar from a normal part of your breakfast table into a cute wedding decoration? You can even incorporate jars into your lighting theme by placing coloured tea light candles inside them. 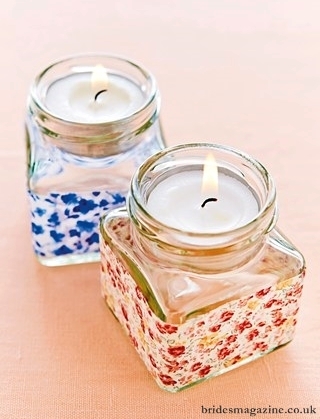 The jars can then be decorated by mounting a strip of pretty fabric or lace around the edge. If you fancy a little more colour, coat empty jars with a generous splash of bright blackboard paint and leave them to dry before adding a second coat. 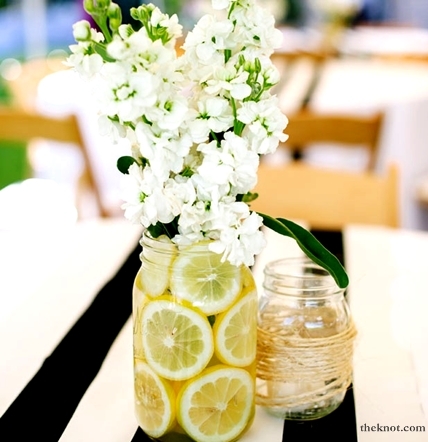 You can then use marker pens to add table numbers to the jars and use them to hold flowers. If you’re concerned that your expensive lilies and roses will wilt in the heat of a hot tropical afternoon, leaving your wedding décor in tatters – worry no more. 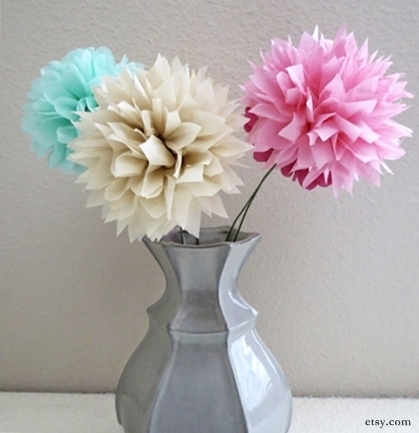 Many natural blooms are accustomed to withstanding the heat, but can bypass fresh flowers altogether by creating your own paper pompoms. Choose what colour tissue paper you want to use and stack eight sheets on top of one another. Create a concertina effect by folding the sheet over repeatedly until completed, then tie them up with a piece of floristry wire and carefully use scissors to create curved edges at each end. Finally, separate the layers of paper to form a ball, then tie a string in the middle of the pompom to hang it up. Brides and grooms in love with colour will not be able to resist the idea of turning their wedding tables into kaleidoscopes. Following the manufacturer’s instructions, you can dip a napkin in and out of colourful dyes, then dip again to the middle, and finally dip the bottom and hold it in for two minutes to create a stronger colour. Rinse them off with cold water and hang them out to dry. 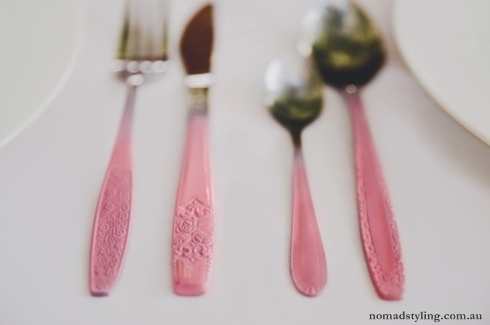 You can even apply the same dip-dye technique to the cutlery. You can pretty much guarantee the presence of flowers at a wedding, whether you see them in the bride’s bouquet or in a floral centrepiece. However, if you love colour but are not a flowery person, you can add a pop of colour to your guests’ tables by adding fruit instead. Southeast Asia is the home to endless brightly coloured exotic fruit varieties, including mango, watermelon and papaya, all of which pack in a lot of colour. Filling large jars with fruit (and flowers if you can’t resist) will certainly spice up the wedding décor, no matter the setting.